Discussion in 'General Bushcraft Discussion' started by Primordial, May 10, 2018. It seems to be GAW madness that's happening here on BCUSA so I'm going to kick off a GAW t.darrah style. I'm looking to recruit 3 BCUSA members with supporter status to take this blade out and put it through it's paces. 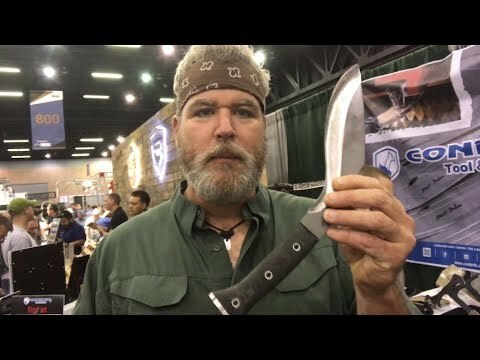 Each member should have the blade for at least one good outing where this knife should be used for shelter building and fire craft, along with what ever other clever ideas the recruits come up with. Be creative and come up with interesting tasks. Examples may include the sacrificial beheading of a water buffalo for a crazy AWOL Colonel, fighting your way out of a zombie infested mall, chopping your way out of a Volkswagen beetle or making a PB&J sammich. You get the picture. You do not need to pull an overnighter, but your shelters must be worthy of something that you would want to sleep in. 1) Must be forum member with Supporter status! 2) Must agree to post bushcraft challenge outing report(s) with pictures and or videos. 3) Must agree to ship the knife to next participant in good condition (clean, sharp and ready to use) and cover the cost of insured shipping (the knife must be mailed out by the next of each month). 4) Agree to participate in scoring. Scoring based on quality of Challenge report(s) posted. 5) Best score gets the blade. I hope all who participate make interesting and entertaining contributions to this forum. colter, SouthernJourneyman, kronin323 and 44 others like this. central joe, NevadaBlue, Winterhorse and 6 others like this. Way to go @Primordial ! Awesome idea. You should do a report with it too. central joe, NevadaBlue, BalsamFur and 8 others like this. I can't, because my report would be the BEST and no one else would win it. Madwell, chndlr04, central joe and 14 others like this. Cool idea for a giveaway, I like it. central joe, NevadaBlue, Broke and 7 others like this. Like stated earlier, the forum will step up to fill the void. Good on you Primordial! chndlr04, central joe, NevadaBlue and 11 others like this. DavidJAFO, Quinlan, Zaveral and 16 others like this. central joe, NevadaBlue, gohammergo and 7 others like this. central joe, NevadaBlue, gohammergo and 8 others like this. Id be in but im moving to ft rich ak. I have to find a hoise and everything else. Ill have time for @Broke junglass passaround unless its later on in the year. Winterhorse, central joe, NevadaBlue and 6 others like this. Anyone notice that the avatars of @t.darrah and @Primordial kinda look alike now? Winterhorse, central joe, NevadaBlue and 5 others like this. Awesome knife not in on this one. What a really cool GAW thank for doing this. central joe, CivilizationDropout, Broke and 3 others like this. Im a BIG fan of kukris. I only have one and it tops any machete any day in my book! Very generous of you. Somebody is goin to be very lucky! Winterhorse, central joe, CivilizationDropout and 4 others like this. central joe, NevadaBlue, Simplejack and 7 others like this. I gotta sit this one out @Primordial I just had the Junglas for a week I gotta catch back up on my Kelso stuff for a bit.. but good luck everyone!! gohammergo, MrFixIt, ArmyMacE and 4 others like this. I will do my best to do my best to figure out how this blade works. Thanks, I’ve never held one let alone put one through it’s paces. DavidJAFO, blind & lost, gohammergo and 7 others like this. I'm looking forward to this as well. Its a cutting tool I've never put any time into actually using, I've only held one a few times. Going to be fun! gohammergo, MrFixIt, CivilizationDropout and 3 others like this. Only 2 members have motivational interest in getting a free chopper and having an excuse to get into the bush to have some fun cutting stuff??? Broke, Muleman77, Winterhorse and 4 others like this. I would love to try out a Ghurka style Kukri... to many obligations to catch up on though, with a whole bunch coming at the same time. Better get in on this folks while you can! Looking forward to the results and reports! DavidJAFO, Muleman77, rsnurkle and 5 others like this. You would have been an awesome contender! Muleman77, rsnurkle, MrFixIt and 2 others like this. Come on boys! All he needs is one! MrFixIt, Muleman77, ArmyMacE and 1 other person like this. MrFixIt, Muleman77 and rsnurkle like this. I hope to get the blade sent out this upcoming week if all goes well. Winterhorse, icemanx722, MrFixIt and 4 others like this. DavidJAFO, Quinlan, pellegrino and 10 others like this. ExAF1N1, Quinlan, Winterhorse and 9 others like this. Yeah, no question swamp donkey is the clear winner!! ExAF1N1, Quinlan, Winterhorse and 8 others like this. I was thinking more along the lines of swamp jack wait, whut!? Quinlan, Winterhorse, DarrylM and 6 others like this. The Kukri has shipped! Get ready @Muleman77 ! DavidJAFO, ExAF1N1, Quinlan and 7 others like this. Did you apologize to it first? ExAF1N1, Quinlan, Winterhorse and 7 others like this. I just deleted what I really wanted to type , so all I say is this....GO FOR IT! Quinlan, Winterhorse, ArmyMacE and 4 others like this. DavidJAFO, ExAF1N1, Quinlan and 11 others like this. Quinlan, Winterhorse, icemanx722 and 5 others like this. Quinlan, Winterhorse, Muleman77 and 5 others like this. It's about time to move this along, but it sure has been fun to play with. I got a lot of pics of it doing things, and need to put it all together but here's a couple. It's some kind of stainless, and pretty tough. For an armload of hard dry oak, I walked down to the garden, and easily did this without a touchup. That's a green zebra mater, and a 4th of july. Just a preview, until I make time to put a real report together. DavidJAFO, Quinlan, Madwell and 6 others like this. WHERE ARE WE AT @Muleman77 ??!! Quinlan, Winterhorse, rsnurkle and 4 others like this. It’s on it’s way to me. As I said I have never even held one in my hand so I have no idea what to expect. Hopefully I can allow the tool to teach me how to use it. It must be an efficient design or it wouldn’t have lasted in this shape for centuries. Looking forward to either learning something totally new or making a fool of myself. I can live with either. DavidJAFO, Quinlan, Primordial and 2 others like this. Still looking for the knife. DavidJAFO, Muleman77, Quinlan and 3 others like this. MrFixIt, Muleman77, Quinlan and 2 others like this. I am eager to follow the kukri's escapades. I hope it didn't get lost in the mail. DavidJAFO, MrFixIt, Winterhorse and 2 others like this. It's not lost. it took a trip out and back however......I am told it came back to sender (mrs muleman) about a week ago! I'm still not home, but its there. I'm almost there. I will check the address, and send it again. It may have been a mistake in translation, not sure. None of these delays would have been long, or happened at all were it not for me being away so long this season, sorry about that! DavidJAFO, MrFixIt, ExAF1N1 and 5 others like this. I have an outing planned for weekend after next. DavidJAFO, MrFixIt, CivilizationDropout and 3 others like this. MrFixIt, CivilizationDropout, Winterhorse and 2 others like this. MrFixIt, CivilizationDropout, Primordial and 2 others like this. This is a shot of it next to my EDC. DavidJAFO, ArmyMacE, SkipJunkie and 5 others like this. rsnurkle, CivilizationDropout, ArmyMacE and 1 other person like this. Dang! I owe a review. I’ll do that as soon as I can. rsnurkle, ArmyMacE, Primordial and 1 other person like this. @Muleman77 also has not put in his review yet. It can be your choice to put a review now, or wait until @CivilizationDropout finishes his time with the blade and then every one can start posting their action once he is done. rsnurkle, ArmyMacE and CivilizationDropout like this. I'm going to be a kukri basket case this weekend. rsnurkle, ArmyMacE and Primordial like this.